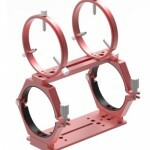 This kit, composed of plate 495mm PLUS Losmandy dovetail bar and PLUS curved blocks, can be installed either below (for connecting a Losmandy type dovetail bar under the telescope) and above (for supporting a parallel telescope) to the C9.25 or C11 Schmidt-Cassegrain or EdgeHD 925 and 1100 aplanatic Schmidt-Cassegrain telescopes by Celestron. 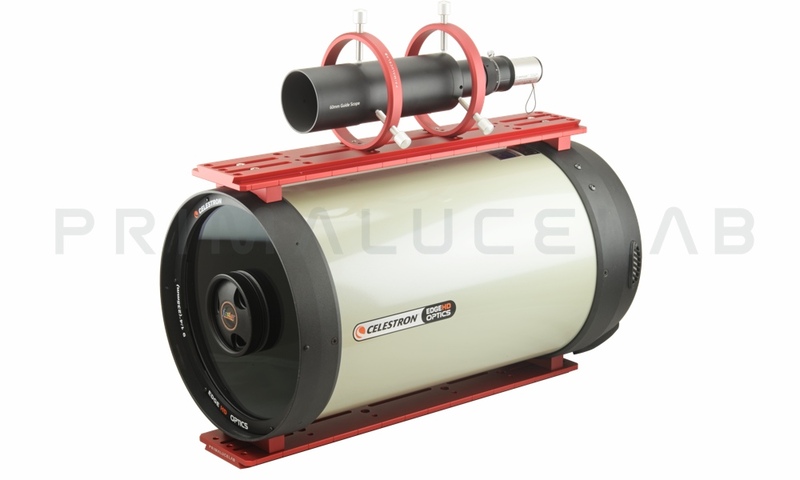 PLUS curved blocks for Celestron C8, C9.25, C11, EdgeHD 800, 925, 1100 or Meade SC and ACF 8"
The curved blocks can be easily installed on C9.25, C11, EdgeHD 925 and EdgeHD 1100 telescopes. Simply remove the screws already on the telescope and fix the curved blocks (one in front, one in rear of the optical tube) and secure with the same screws. On the curved blocks you can then connect the 495mm PLUS Losmandy dovetail bar using 2 M6 screws for each curved block (included in the box). EdgeHD 925 telescope with the Losmandy PLUS dovetail bar with curved blocks installed both above and below the telescope.